"Tarakan" redirects here. For other uses, see Tarakan (disambiguation). The name Tarakan comes from the Tidung language: Tarak (meeting place) and ngakan (to eat); thus Tarakan was originally a meeting place for sailors and traders in the Tidung area to eat, rest and trade their catch. According to legends, native Tidungs established their kingdom in Tarakan around 1076 CE. After moving their capital several times over the centuries, in 1571 CE they settled their kingdom on the eastern coast of Tarakan, apparently already under influence of Islam. Dutch explorers noted oil seepages in 1863. In 1905 an oil concession was granted to Koninklijke Nederlandsche Petroleum Maatschappij, a predecessor to Royal Dutch Shell. One year later oil production began with a yield of over 57,928 barrels of oil per year. Production continued to increase and in the 1920s Tarakan yielded over 5 million barrels a year, a third of the total oil production in the whole Dutch East Indies. The oil produced here had a paraffin base instead of the usual asphalt base. Tarakan oil field produced a light, sour crude oil with an unusually low pour point. By 1940 the island had an oil refinery with four petroleum loading piers, and was one of the five largest petroleum processing centers in the East Indies. Japanese oil fields in Sakhalin and Formosa provided only about ten percent of the petroleum needed to sustain Japanese industry. Reserves of California crude oil at Japanese refineries would have been exhausted in less than two years at the rate of consumption when United States terminated exports to Japan on 26 July 1941. Japan initiated hostilities against the United States and the United Kingdom four months later in preparation for seizing alternative sources of petroleum in the East Indies. Japan declared war on the Netherlands East Indies on 10 January 1942; and Japanese troops landed on Tarakan the following day. Dutch forces had declared war on Japan a month earlier, and sabotaged the oil field and refinery prior to surrender. Japan had captured the Miri oil field in December, and proceeded to capture oil fields and refineries at Balikpapan in January, Sumatra in February, and Java in March. Oil technicians accompanied the invading troops in attempts to maintain production at captured facilities. A team of one thousand additional petroleum engineers and technicians sailed from Japan aboard the Taiyo Maru, but nearly 800 drowned when the ship was sunk southwest of Kyushu by the USS Grenadier on 8 May 1942. Despite this loss, Tarakan crude oil (mixed with lesser quantities of Manchurian oil shale distillates) became the primary feedstock for Japanese diesel fuel in 1942 while reserve supplies of California crude oil remained the primary feedstock for Japanese gasoline and residual fuels until 1943. 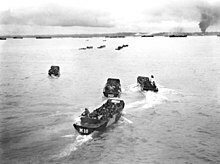 Allied landing during Battle of Tarakan (1945). Tarakan became a Japanese strategic air base from which further attacks could be launched following the Dutch surrender, and Tarakan's inhabitants suffered under Japan's occupation. The large number of Japanese troops stationed on the island caused food shortages and many civilians suffered from malnutrition as a result. During the occupation, the Japanese transported some 600 labourers to Tarakan from Java. The Japanese also forced an estimated 300 Javanese women to work as "comfort women". 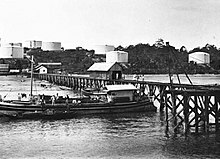 Tarakan oil field production reached 350,000 barrels per month by early 1944, but Japan no longer had enough oil tankers to transport this volume to Japanese refineries. Without adequate supplies of refined residual fuel oil for the Battle of the Philippine Sea, Japanese aircraft carriers refueled with unrefined Tarakan crude oil in June 1944. This undesalted crude oil damaged boiler tubes, and the unremoved naphtha fraction volatilized to form explosive atmospheres contributing to the loss of aircraft carriers Taihō, Shōkaku, and Hiyō. The last Japanese tanker left Tarakan in July, 1944; allied bombing raids damaged the oil field facilities later that year; and the veteran Australian 26th Brigade Group ended Japanese occupation with the second battle of Tarakan from May 1 – June 21, 1945. Following the Indonesian revolution, Tarakan became part of the new republic. In 1981, Tarakan was granted a city charter, at that time one of four cities in East Kalimantan, along with Samarinda, Balikpapan and Bontang. After North Kalimantan was established as a province in 2012, Tarakan became the sole city within the new province. 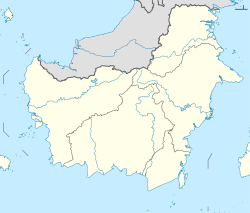 Tarakan had a population of 193,069 at the 2010 Census. Native residents are the Tidung, a subgroup of the Dayak people. In addition, the city also has a multi-ethnic population from other parts of Indonesia, such as Bugis, Javanese and Chinese Indonesians. The majority of the population is Muslim, with a minority of Christian and other religions. Relations between ethnic groups are generally peaceful, although Tarakan witnessed deadly clashes in the 2010 Tarakan riot. Tarakan is served with several ferries, linking it to other cities on eastern Borneo: Nunukan in North Kalimantan, Berau and Balikpapan in East Kalimantan, and Tawau in Sabah. The port also provides links to cities on other Indonesian islands: Sulawesi and Java. Tarakan has an airport called Juwata Airport, located 3.5 km from the city. The airport has domestic flight routes to Balikpapan, Jakarta, Surabaya, Denpasar and Makassar, as well as an international route to Tawau, Malaysia. Once, the city was a leading oil producer in Dutch East Indies; to-day however, oil only comprises 6% of the total Tarakan economy. The economy is now dominated by fisheries and forest products. Tarakan island is of ecological importance. The island is one of the habitats of the proboscis monkey. Tarakan also provides breeding ground for marine and bird species. ^ "Hari Jadi & Sejarah". Tarakan Municipal website. ^ Prasetyo, Deni (2009). Mengenal Kerajaan-Kerajaan Nusantara. Pustaka Widyatama (Yogyakarta). ^ European foreign investments as seen by the U.S. Department of Commerce. United States Bureau of Foreign and Domestic Commerce. 1977. ^ "The Pacific War Online Encyclopedia". Kent G. Budge. Retrieved 2011-02-17. ^ Dull, Paul S. A battle history of the Imperial Japanese Navy, 1941-1945. ^ "Sekilas Tarakan". Tarakan Municipal website. ^ Atiyah, Jeremy. Rough guide to Southeast Asia. Rough Guides. ^ a b Roberts, Brian; Trevor Kanaley (2006). Urbanization and sustainability in Asia: case studies of good practice. Asian Development Bank. This page was last edited on 11 January 2019, at 04:07 (UTC).